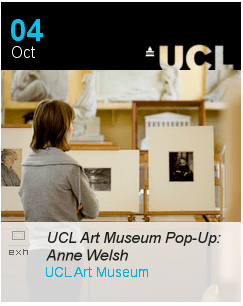 At lunchtime on 4 October 2011 UCL Art Museum will be hosting a pop-up exhibition for which I am selecting works of art that started life as book illustration. You can read more about the pop-up and the Autumn exhibition in which it takes place on the UCL DIS Staff Blog. 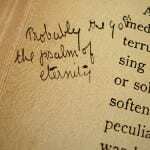 Over on the UCL DIS Student Blog you can read about the first workshop held by the Playing the Margins project, which uses UCL Library Services Special Collections to explore annotation practices with actors, drama students and academics. Read Paris’s full post on the UCL DIS Student Blog, where there are also details of how to sign up for the second workshop which takes place at the end of the month. As the clock ticks to midnight, I thought I would start the Day of Digital Humanities with a post about Playing the Margins, a public engagement project led by MA LIS students Paris O’Donnell and Sian Prosser. Sian and Paris have both taken Digital Resources in the Humanities and Historical Bibliography, and we are delighted to see them putting their learning (and previous experience) into practice in this project, funded by UCL’s Train & Engage Scheme. The aim of Playing the Margins is to bring drama students and actors into UCL Special Collections to engage with early printed books relating to their interests. The project is being supported by the Public Engagement Unit and Special Collections at UCL. The workshops concentrate on readers’ marks and annotations, and give participants insights into how earlier readers left traces of their engagement with dramatic (as well as non-dramatic) texts. Inspired by our studies of digital humanities and historical bibliography at UCL DIS, Playing the Margins is an experiment in using digital tools to explore reading practices and dramatic performance. In the workshop, participants will be invited to reflect on their own marking practices in scripts and play-texts, and to think about taboos or proscriptions relating to writing in books. Then, participants are presented with examples of interesting annotations, ownership marks and other readers’ marks taken from UCL’s Special Collections, so they can explore the continuities between their reading/annotating practices and those of early readers. The workshop concludes with participants inscribing virtually a photographic image of a text they have encountered, using a digital tablet which captures handwriting. Their recorded hand-written engagements will form the basis for an online blog and exhibition, which will also showcase participants’ further written and/or spoken reflections on the workshop. We’re really looking forward to hearing more about Sian’s and Paris’s experiences and findings through the project, and especially, to following the blog that they are in the process of setting up. Watch this space (and Sian’s Day of DH blog) for more. Last Thursday, Julianne Nyhan and I accompanied some of the students from the Historical Bibliography module on a visit to the Bibliography Room in Oxford. The trip was suggested by Elizabeth Gallagher, who as well as studying on UCL’s MA LIS, is a member of staff at the Bodleian Library, and who was able to introduce us to Paul Nash, who runs printing workshops. Historical Bibliography is a ten-week module comprising a series of lectures on the history of the book and hands-on sessions at UCL Special Collections. From September 2011, it will be an optional module for the new MA DH. Early in the course, the whole class also visits St Bride’s Printing Library, where they can see printing presses. At our last visit in October 2010, St Bride’s wasn’t quite ready to give practical experience in printing, so for the eleven students who opted into the Bibliography Room trip, this was their first experience using a handpress. I asked the students and Julianne if they would be kind enough to share their thoughts on the visit, and how it had affected their thinking about printing and its impact on their work, as librarians, and in Julianne’s case, an academic in the online-always world. Initially, the intention was to include some quotes in a blog post, but the responses were so interesting that I decided I couldn’t really cut them down. So I’ve compiled a slideshow report, and Julianne has given permission to upload her impressions and link to them as a pdf. There has been a massive shift from the use of the type mould and typeset plate to the use of Word and programming languages for web publishing, but that only made me realize how much potential there still is for things to change later on. I had initially approached this outing from a historical perspective, hoping that it would help me grapple with some of my research questions. I had not expected that it would enable me to examine what is for me the utterly normal and every day act of using a computer to write with and through in an utterly new way. For any lecturer, there is possibly no greater pleasure than sharing your passions with students and colleagues, and seeing them integrate them with their own existing experiences – taking them, and therefore you, somewhere new. Many thanks to Paul Nash, Elizabeth Gallagher and the Bodleian Library; and to Julianne Nyhan and the Historical Bibliography students – it’s wonderful to see my own discipline from fresh eyes, almost as a tourist at home. Yesterday I attended the British Library / JISC Conference Digitised History: Newspapers and their Impact on Research into 18th and 19th Century Britain. Linked to the launch of the British Library Newspapers 1800-1900, which offers online access to “articles from 49 London, national and regional newspaper (1800 – 1900) titles”, the conference brought together expert speakers who use digital resources in researching and teaching History. Our Director, Claire Warwick, was a panellist in the final plenary discussion. My own interest was as a researcher in 19th century publishing history, but my motivation for attending was as the tutor on the optional module on Historical Bibliography for the MA in Library and Information Studies here at UCL: it’s vital to keep up-to-date on new research tools that students may need to use, not only in the module itself but also in their final dissertation if they choose a historical topic. I have to say that all the presentations were extremely useful, and I left with not only enough material for the 15 minute segment I’ll give this year’s class on the new database, but also for a seminar session on the use of digital versions versus the original object. Speakers gave good case studies as well as opinions on both sides of the digital divide – the Institute of Historical Research created an archive of the tweets, which I recommend reading, as this blog post has to be selective on the grounds of space, and there is so much more that could be included. the physical nature of the screen can itself obfuscate the layout of the newspaper – browse facilities do exist and should be used by researchers to gain an idea of context. different editions of newspapers were published, and it is important for researchers to be aware of this; and the fact that often only one edition is digitised (indeed the BL’s policy at Colindale for the physical newspaper collection, was generally to retain only one edition (usually the latest edition). The general feeling of the day seemed to be that while we should be cautious, and aware of the limitations of digital resources, the benefits could be immense. Keynote speaker Dr Patrick Leary highlighted that historians of the Victorian era are moving from a scholarly economy of scarcity to one of abundance, and, bearing in mind some of the limitations, it is now possible to look up facts about the daily life of Victorian people in a way that was time-consuming and costly (in terms of travel expenses) to previous generations of scholars, like Richard Altick (author of the seminal English Common Reader). He highlighted Cohen and Gibb’s recently Google-funded project Reframing the Victorians, which will use new digital resources to re-examine Walter Houghton’s influential thesis in The Victorian Frame of Mind that Victorians were largely optimistic, judging by their use of certain language – thanks to the quantity of the corpus that exists online now, and the digital humanities tools that have been devised, it will be possible for them to look at a far wider range of vocabulary than Houghton could manage manually. As a lecturer, I was really inspired by some of the research exemplified and by some of the teaching that is being undertaken; and by the number of attendees at the conference keen to learn more about using these resources and introducing them to their classroom teacher.As a traditionally qualified librarian and historical bibliographer, I was equally pleased to hear Dr Moira Goff ask us to think about the future role of the original items, and, indeed, the future of the original items themselves. It seemed appropriate that the final remark of the day, from a member of the audience, should be that wonderful and empowering as digitised versions are, there are some things that we can only see and investigate on the book (or newspaper) as object itelf. 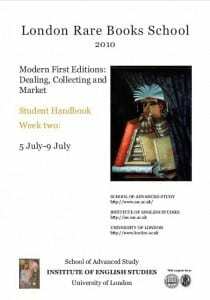 I’ve spent this week at the London Rare Books School (LRBS), taking a course on Modern First Editions. This course is unique at the LRBS in that it is taught entirely by booksellers, principally Laurence Worms (Ash Books) and Julian Rota (Bertram Rota). As a traditionally qualified librarian, who studied under John Turner at Aberystwyth, this course gave me a completely different perspective on books as objects and books as commodities. “Commodities” may sound overly harsh and give a false impression: our tutors this week love books as much as librarians and other scholars – it’s just that they trade in them and make their living directly from them. I was heartened on our visit to legendary bookseller Rick Gekoski to discover that there is still a healthy market for beautiful and unique things, and excited on our trip to Cecil Court to discover new ways of dealing in specialist books. It was also a relief to hear that booksellers are just as concerned about the move to digital as librarians. Julian Rota was a panelist at the British Library’s Digital Lives conference last year, and as one of the most experienced and distinguished brokers in literary manuscripts is actively involved in discussions with the top research libraries and with authors themselves about the future scholarship (and market) of archives on computer. The book trade has been revolutionised by the growth of Amazon, ebay and Abe books, as well as the ability to track auction records online. There are pluses as well as minuses, and businesses like Goldsboro Books that could not have started without the Internet, as well as smaller, provincial, traditional bookshops whose doors have been helped to close by the availability of cheap books through the Web. The last academic article on the impact of the Internet on the book trade appears to be Whewell and Souitaris in 2001. Perhaps it’s time for another action study gathering the opinions of the traditional antiquarians before they retire? What would you give to read Shakespeare’s emails? What would you give to read the emails Shakespeare deleted? We might need more equipment and the book as object may be less tactile in its electronic form, but as far as literary electronic records go, bring on the brave new world!